Apparently my post yesterday struck a chord in a couple of people. Not to wallow in it but I've been thinking about Mommy Guilt and had some random thoughts. A friend at work noted that she was jealous and upset when her little girl wants to be comforted by her husband (who is currently taking care of her daughter at home). Another fried is upset how many bedtimes she's missed. Here's something I read in Penelope Trunk's blog that seems so true: "If you take a man and a woman doing the same office job and the same parenting job, the man will think he’s doing a good job at parenting, but not the woman." Would a working dad be upset if a child preferred his or her mom or would he probably think - "well, after all she is the mom?" Would a working dad be upset about missing doctor's appointments or bedtime because of client needs? Be stressed about whether the mom he left at home had enough resources not to feel overwhelmed? I wonder if some of the problem is the expectation that we should *feel* a certain way being working moms. Shouldn't I be conflicted about being at work? Shouldn't I want to run home for bedtime or be there for doctor's visits even if client matters are pressing? Shouldn't my heart feel sore when I check on them at night while sleeping because I haven't seen them all day? I *think* society expects me to have those feelings and my guilt is more associated with not meeting that expectation - after all I know the kids are fine and husband is more than an equal parent. I'm not saying I don't have the twinge but I have the same one worrying about whether I'm a good enough lawyer. This week and last have been the first two weeks where my job meant I was less of a parent than my husband. But since this is an ebb and flow next week I might be the one who has the more flexible schedule. Time to let the Mommy Guilt go and be a Co-Parent. I like the idea of just forgetting about the competition between parents and instead just focusing on the fact that the kids are being parented by someone who loves em. Replace the guilt over missing a practice or peformance with the confidence your kids know you love them. Part of what we do when we love someone is take care of them, and work provides the ability to do that. And even if your work isn't about the income, you are teaching your kids about what it means to be a grown up who enjoys what they do. Awesome post you wrote! LOVE IT! Co-parent. I like that. I definitely don't feel like a co-parent. With my husband being away all the time, I feel like the magician and he is just my lovely assistant. You know, I do all the leg work and he just shows up for the big show. While he's here, he's helping - but no matter what, you always need the magician to have a magic show. And so is our life. My mommy guilt doesn't come from what I miss but from what I would like to miss. I feel guilty that I'd rather be a co-parent sometimes and not the "head" parent. And yes, I do think that no matter what role we have, us moms feel guilt either way. They actually touched on this in an epsiode of House - Cuddy just adopted a baby and was trying to "do it all" and Wilson was like, "If a guy was in your shoes, he'd have two assistants at work, a nanny, and a wife. And then everyone would say what an awesome parent he is." So true Wilson, so true. I was totally going to post the House quote! Glad someone looked it up. No one says these things to my husband, but as a busy lawyer, it is JUST AS HARD for him. We truly are co-parents. If anything, it's harder for my husband because most people he works with don't understand why "his wife" can't pick up the kids every day. I feel the same way. I feel the twinges in both directions. I have thought about being a stay at home mom, but I don't think that would make me a better mom. I am not made to be a SAHM. I think those women who can be SAHMs are great, but it's not for me. I know there are times my husband spends more time with the kids than I do, but as you said it is a give and take thing. My kids are happy and well adjusted. We have lots of love in our home. 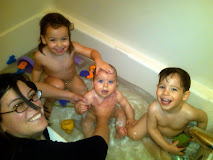 The twinges just mean we really love our kids and we miss them when we are away. It just means you are a GREAT mom. More power to you. I completely trust my husband and know he does a great job when I can't be present to parent. I guess my vision of "co-parenting" is having us both present to enjoy our daughter and share the responsibility of raising her, rather than trade days based on our schedules. I know it's a wee-bit unreasonable given all we have to juggle, but that's the way I'd have it if I could write the script. That's why I get really upset when I can't be present. As we try to navigate the waters of co-parenting you will find that there are some rough seas ahead then too. Just last night, the baby woke up and for once I wanted DH to actually get up first, but no it was me. Caused an argument at 1:30 am, which was not fun. GL! I don't think there is any way to avoid mommy guilt. It just comes with the territory of being a mom. Even when I'm at home with the kids, I feel guilty if I'm dragging them on errands or parking them in front of the tv while I make dinner or clean up one of the thousand daily messes or whatever... All the while thinking that we should be going on more playdates or on educational "field trips" to museums or something. And when I'm working, I feel bad that they are in daycare (even though they have a good time and learn new things). I am not in favor of the so-called "mommy guilt", but I would hate to see you ignore your true mothering instincts (for instance, the ones that tell you that you DO want to and SHOULD be there for bedtime), and just explain it away as something that society has put on you etc. Maybe you should try listening to these impulses and even *consider* re-prioritizing your work/family arrangements accordingly. Please don't feel guilty after reading this comment! Just a thought.